How to Rip DVD Transformers 4: Age of Extinction with HandBrake? Transformers 4: Age of Extinction, one of most anticipated movies in 2014 summer, received unexpected harsh criticism after release. Despite negative reception, lower rating on popular movie review sites, it obtained a great commercial success with over 1 billion dollars gross worldwide. Certainly, the amazing CGI and stunning special effects pleased many moviegoers. If you are a viewer quite appreciating this film or have a big interest in it, you can purchase or borrow a DVD and rip DVD Transformers 4: Age of Extinction with HandBrake for long time storage or watching full movie with portable devices anytime anywhere. How to Rip DVD Transformers 4? Best HandBrake Alternative software to rip copy protected DVD Transformers 4: Age of Extinction on Windows/Mac OS X. 1. Import DVD by hitting Source button and select one title to convert. 2. Hit Browse to set destination to save converted video. 3. 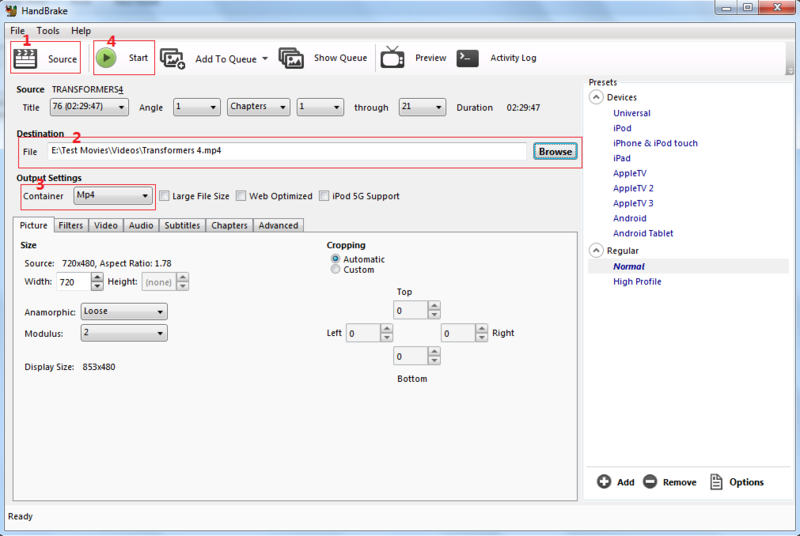 Select MP4, MKV or devices as output profile. 4. Click Start button to rip DVD. As Paramount Pictures movies, the Transformer: Age of Extinction DVD is probably encrypted for copyright protection. During ripping it with HandBrake, you will discover that all 99 titles cannot be totally detected and the automatically selected title is not the real main title. Moreover, chapter may be out of order caused by CSS encryption. Also, HandBrake cannot meet your requirement if you need to rip DVD Transformers: Age of Extinction to AVI, WMV, MOV, FLV video formats. Although it offers devices profiles, you should adjust parameters to make the converted video completely compatible with specific devices models, for example iPhone 6/6 Plus, iPad Air 2, Samsung Galaxy Note 4/Edge, HTC One. In order to address the above problems, it is better to make use of the best HandBrake alternative - WinX DVD Ripper Platinum to rip DVD Transformers: Age of Extinction effortlessly and faultlessly. 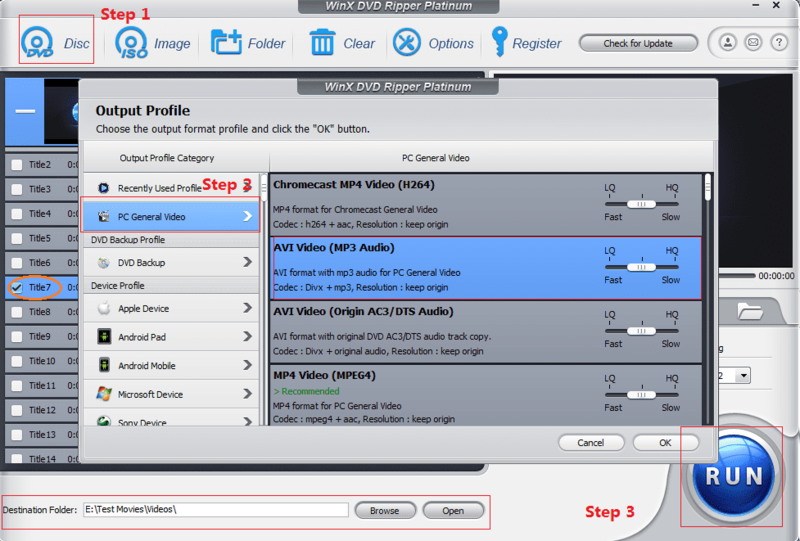 WinX DVD Ripper Platinum is good at ripping any commercial DVDs, even latest protected ones, to popular video formats, AVI, WMV, MOV, MP4, FLV, MPEG etc. It offers a large amount of portable devices profiles, including nearly all iPhone/iPad, Andorid phone/tablets models so that you can directly select the appropriate output formats instead of taking much time to customize parameters. 1. Insert Transformer: Age of Extinction DVD into DVD-ROM and click DVD Disc, the first button on navigation bar, to import it. 2. A couple of seconds, total 99 titles will be detected and the correct main title is automatically checked. Then, select one video format as output profile, for example AVI. Access PC General Video category and choose AVI Video. 3. Click Browse button to save converted AVI video to destination folder. Hit Run button to convert DVD Transformers: Age of Extinction. Note: Please check DVD copyright laws in your country carefully before ripping DVD Transformers: Age of Extinction. * Convert movie ISO image or Video_TS folder to diverse video formats and mobiles. * Copy DVD to ISO/DVD folder and backup full/main title to a single MPEG2 file. * Personalize parameters and edit videos, cropping/trimming/merging videos/adding subtitles. WinX DVD Ripper Platinum - Rip and backup DVD Transformers 4: Age of Extinction to any popular video formats and overall devices with no effor at all.